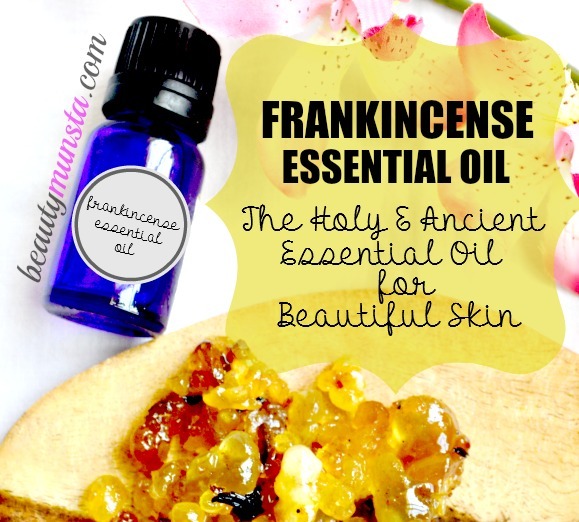 Top 10 Benefits of Frankincense Essential Oil for Skin - beautymunsta - free natural beauty hacks and more! 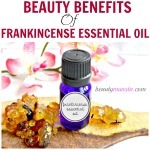 Discover the top 10 benefits of frankincense essential oil for skin! Once costing worth more than its weight in gold, this luxurious essential oil has always been used in the Arab world for its healing, cleansing, & aroma therapeutic properties. Many Arab homes of today still burn frankincense resin to benefit from its amazing medicinal properties. Frankincense essential oil is said to fight cancer, relieve stress, boost the immune system, kill harmful germs and bacteria, balance hormonal levels, ease digestion, reduce inflammation, act as a sleep aid, promote healthy teeth & germs, relieve nasal congestion and reduce scars & stretch marks & so much more. In this post, I’ll be focusing on the benefits of frankincense essential oil for skin as seen below. Frankincense essential oil contains so many fabulous skin beautifying properties including anti-inflammatory, anti-acne, anti-aging, antibacterial, anti-scarring and astringent properties that will make your skin look more beautiful than ever! ►Facial Mask: Make a facial mask using 1 teaspoon of raw honey, 1 drop of frankincense essential oil and 1 teaspoon oat flour to smooth, soft & supple skin. Frankincense essential oil is a natural germicide and disinfectant and that’s one of the reasons why frankincense resin is usually burned in Arab homes. This same property of is responsible for fighting off acne causing germs and disinfecting acneic skin, thereby helping prevent acne. ►Direct Application: Dabbing a drop of frankincense essential oil onto your pimples using a q-tip is a good acne spot treatment to kill germs and treat acne naturally. One of the most important reasons why people use frankincense essential oil for skin is because of its powerful anti-scarring properties. It is said to help heal and fade acne scars at a faster rate due to its skin healing properties. ►Spot Treatment: To reduce the appearance of scars and gradually fade them away, add a drop of two of frankincense essential oil on your finger and apply it on the scar. Then using two fingers or your thumbs, rub in the oil vigorously in the opposite direction. This method is known as cross section and helps in breaking up scar tissue. 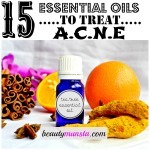 Frankincense essential oil is one of the top best essential oils for aging skin. Its skin rejuvenating properties are known to revitalize dull, tired, sagging mature skin. It’s anti-aging properties help fight off free radicals that cause fine lines and wrinkles. ►Anti-aging Cream: An anti-aging cream can be made by combining whipped shea butter and a few drops of lavender essential oil, geranium essential oil and frankincense essential oil. Frankincense essential oil can be rather drying for some sin types but that’s good news for people with very oily skin! Since frankincense is a natural astringent, it helps regulate sebum, reduce large pores, tone & firm skin. ►Oil-Control Face Wash: To reduce oily skin, you can combine a few drops of essential oil in your facial cleanser and use it to wash your face. Click the image above to read the benefits of frankincense essential oil & recipes for acne! Frankincense essential oil is can be used to gradually reduce the appearance of stretch marks & unsightly scars. It works effectively for both old and new scars. Use the same cross section method mentioned above to help reduce scars. 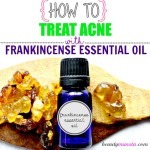 Dry, cracked and parched skin can be healed using frankincense essential oil. All you need to do is add a few drops in a base cream or carrier oil and apply on the affected areas. ►Moisturizer: Mix 3 drops of frankincense essential oil oil in an ounce of castor oil and apply it on cracked heels on the feet before bed. Put on some socks to prevent staining your sheets. Reduce any type of inflammation on the skin using frankincense essential oil since it has potent anti-inflammatory properties that will cool down acne inflammation, eczema, sun burns, psoriasis and any other skin inflammatory condition. ►Soothing Body Mist: Make a refreshing sunburn body mist by combining 3 drops of frankincense essential oil with 3 drops of peppermint essential oil in 250 ml of distilled water. Spritz onto your skin for soothing relief. One of the less known benefits of frankincense essential oil for skin is that it helps in the extraction and prevention of ingrown hairs. Since frankincense essential oil is anti-inflammatory, it will help remove any inflammation around the ingrown hair and its antiseptic properties will protect the ingrown hair from getting infected and turning into a boil. ► Antibacterial Lotion: You can apply a drop or two of frankincense essential oil onto your ingrown hairs with a q-tip, however, for those with sensitive skin, simply mix a few drops of the oil in your body lotion and apply to avoid irritation. 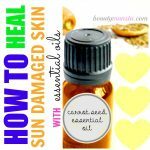 There are a few specific essential oils for sun damaged skin and frankincense essential oil is just one of them. Fundamentally, frankincense essential oil is used to take away the pain from about by sunburns but it also helps in speedy recovery of the sun damaged skin because it promotes cell regeneration and new skin growth. ►Cooling Gel: Mix a few drops of frankincense essential oil in aloe vera gel and apply it onto your sun damaged skin for immediate relief and fast repair-action. There are many fake versions of frankincense essential oil out there in the market. Don’t make a mistake of buying ‘frankincense oil’. Only purchase ‘frankincense essential oil‘ because the ‘frankincense oil’ is just frankincense essential oil mixed with other oils/ingredients so it’s not the pure and potent one I’m talking about in this post. Please make sure to buy 100% pure and high quality frankincense essential oil. Most essential oils are not recommended to be used by pregnant or breast feeding women. Please consult your doctor before you attempt to use any essential oils. Keep essential oils away from the reach of children. When purchasing frankincense essential oil, always look for 100% pure & high quality essential oils. The above information is only for information purposes so please do not take it as medical advice. I have been using Frankincense for a period of time on a large patch of skin that itched on my lower leg, was hard and sometimes could peel off the scab like skin. Thanks to frankinsense, the skin problem is cured and am now using it daily as a preventative for any situation that may arise. I thank my daughter for telling me about the healing properties of this wonderful oil. God Bless ~ again thank you.